All Norman & Bella leather goods are made with genuine, high-quality Italian leather. Depending on the type of leather, dirt is often simply removed with a damp cloth or wet wipes. We recommend testing on a hidden area first to check whether the dampness leaves traces on the leather. Color and texture change naturally over time and usage. For longevity, we recommend using transparent leather care cream or transparent polishing sponge, which will enrich the color and renew shine and vitality. Also, we recommend using a protection spray on dark bags, as they may transfer color onto light colored fabric. To prevent leather from developing marks, avoid exposure to direct sunlight and direct heat sources. Leathers might react with fabrics they come in contact with- new dark fabrics & denim may bleed on light colored leather. Keep bags in a dust bag and shoes in a shoe box to prevent dust and dirt. Calf leather is known for its smoothness and softness. For longevity, we recommend treating this leather with a leather care cream (balm), which will help keep it hydrated. Work the cream into the shoe in small circles until shining. Our tumbled leather is soft, refined and has a rich texture. For lifespan, use a soft damp cloth to remove any dirt or dust. Additionally, treat the leather with leather care cream (balm) which will help keep it hydrated. Lamb leather is recognized for its soft texture, buttery feel, and longevity. For keeping the leather smooth, unscratched and hydrated, we recommend treating it with leather care cream (balm). Our skin calf patent leather is coated with a shiny, shimmering finish. Caring for patent leather is simple. Use a damp cloth to wipe any dirt or dust and avoid exposure to hot temperatures. Further, refrain from using cream or care spray. As patent leather can absorb ink and dye, we recommend storing the shoes apart from other materials and keeping them inside a dust bag. Nappa leather is known for its soft touch and smoothness. Clean the leather by using a rubber based shoe polish (make sure to match the color of the polish to the color of the leather) and avoid the use of wax-based polishes and cleaners. Our suede leather is soft, lightweight and delicate. For durability, we recommend pre-treating this leather with a spray protector and avoid exposure to water or other liquids. Clean the leather by using a rubber brush to remove dirt and to smooth marks. 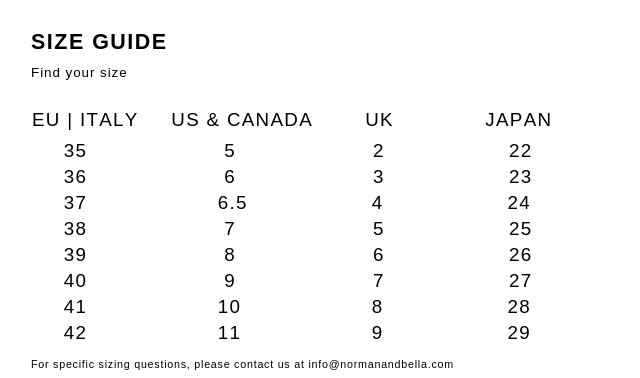 For further assistance regarding care of shoes, bags and other leather goods, please contact us at info@normanandbella.com.